Photo by Richard Stupart, licensed under (CC BY 2.0). AidData's next-generation methods of geospatial analysis enable rigorous impact evaluation where randomized control trials are infeasible. The world invests $2.5 trillion each year on transportation, power, water, and telecommunications infrastructure. But we'll need to invest an average of $3.3 trillion annually just to keep up with expected growth rates by 2030. What impacts, intended and unintended, do these large infrastructure investments have? The "gold standard" method of impact evaluation is a randomized control trial (RCT). Yet randomly assigning the placement of infrastructure projects is almost never feasible—or desirable. Geospatial impact evaluation (GIE) methods provide a solution. Like RCTs, GIEs use treatment and control groups to identify the specific impacts that can be attributed of a particular infrastructure initiative. Unlike RCTs, GIEs use high-frequency, high-resolution satellite observations to measure changes over time in many locations, and they can be implemented remotely and retrospectively. This allows AidData to conduct rigorous impact evaluations at a fraction of the time and cost of traditional RCTs, providing timely insights about where infrastructure projects are likely to be more or less effective. Which roads lead to economic growth? Overlaying USAID project locations with satellite imagery uncovered a key policy insight. USAID wanted to know how its $900 million investment in road infrastructure impacted the Palestinian economy. Using 57 consecutive months of nighttime light measurements at the 750 x 750 meter grid cell level, AidData's geospatial impact evaluation uncovered strong evidence that local economic output improved as a result of road projects. 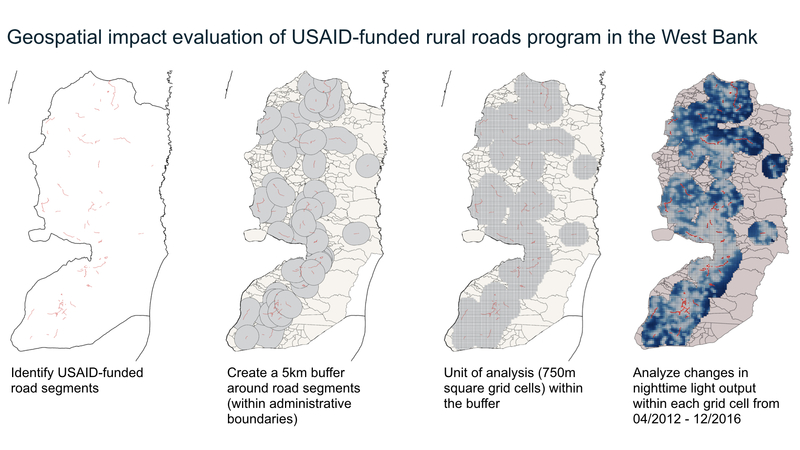 As a result of the high-frequency, high-resolution data used in this evaluation, AidData also found that USAID's investments have even larger economic impacts where communities benefited from improvements to multiple road segments, suggesting that policymakers should prioritize improving roads with multiple access points to a larger network. How do infrastructure projects change inequality? An new way to measure inequality helps evaluators move beyond top-line estimates of average economic growth. How can policymakers tell whether the economic benefits of infrastructure projects are broadly or narrowly distributed? 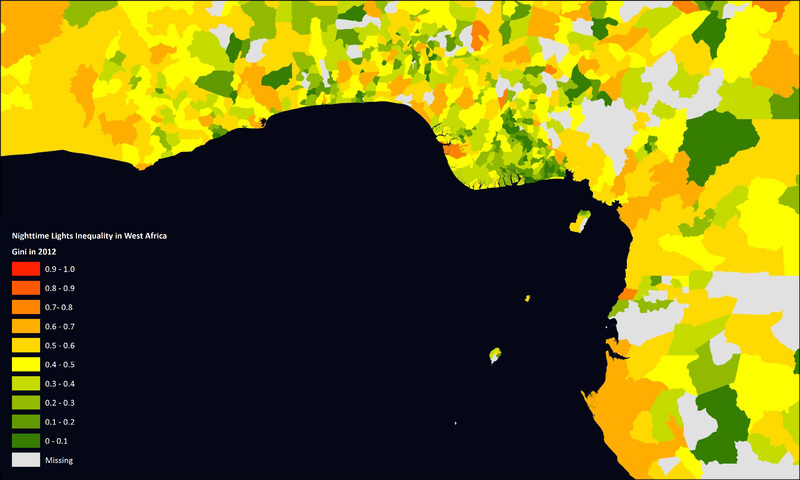 In a new study, AidData and its research collaborators construct a "spatial Gini coefficient"—based on the geographic dispersion of nighttime light—that captures how widely the benefits of economic growth are shared. With this annual measure of economic inequality covering more than 32,000 subnational localities in 138 developing countries, the authors of the study evaluated a global portfolio of Chinese Government-financed development projects. They found that Chinese investments in connective infrastructure—such as roads, bridges, railways and ports—reduced economic disparities within the provinces and districts where they were implemented. How do large-scale infrastructure projects affect forests and biodiversity? Modeling where and how infrastructure projects impact the local environment can help policymakers avoid negative, unintended impacts. AidData and its research collaborators have undertaken a series of geospatial impact evaluations (GIEs) to provide decision-makers with new insights regarding infrastructure projects and their effects on deforestation and biodiversity. ‍One of these studies discovered that World Bank projects subjected to the organization’s most stringent environmental safeguards do not damage local ecosystems. When mitigable environmental risks are identified at the project preparation stage, the study finds that World Bank projects can even reduce deforestation in nearby areas. Another GIE measured the forest cover impacts of Chinese-funded infrastructure projects in Cambodia and Tanzania, finding that while these investments accelerate deforestation in areas with weak forest protection rules, they actually slow deforestation in areas with strong forest protection rules. 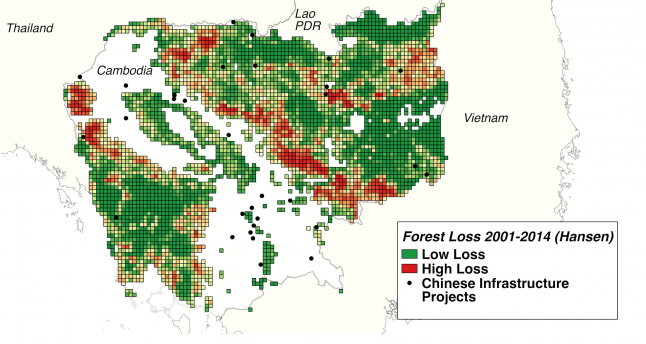 ‍Chinese-funded infrastructure in endangered forests: What is the data telling us?